As I outlined in a previous post, I’m writing a series of blog posts about what being Cajun means to me – the traits typically found people who identify with the Cajun culture. In previous posts, I blogged about resourcefulness , our joie de vivre and the incredible value we place on our family. In this week’s post, I’d like to talk about how being resilient is one of our most valuable qualities. I’ve seen this trait demonstrated consistently in our culture. When the state was hit with 2 large hurricanes within weeks of one another in August and September of 2005, it certainly tested our resilience. Residents housed those who had lost homes and they helped one another rebuild. When the Cajuns were exiled from Nova Scotia, they settled in the swamps of Louisiana – a place no one else wanted to live – and they made it work. During times of economic instability in the main industry in the region – oil & gas – they’ve adapted and survived. I’ve already discussed the resourcefulness trait and when combined with resilience, the outcome is an incredibly strong individual who refuses to give up or run out of options. They can adapt and overcome when others would have simply given up. In times of crisis and trauma, I’ve been thankful to have this character trait of resilience to fall back on – it’s carried me through many tough times. I recall a friend remarking to me how she was stunned that I was able to finish my last semester at LSU after just losing my father to a sudden heart attack. I remember thinking “What do you mean? I had no choice. I had to finish that last semester, graduate and get a job.” I honestly saw no other option than to continue on my path to graduation and get out in the working world as soon as possible. Yes, it was a very painful time – a time of great grief, but I had business to take care of and I suppose you can say the resilience gene kicked in. Another fantastic story of resilience that I’d love to share is when my mother and father were divorcing after 22 years of marriage. There was a small utility trailer that we owned and my mom requested it in the divorce. My father’s reply was something along the lines of “What are you going to do with that? You don’t even know how to back a trailer?” So the next day, my mom went out to the yard, hooked up the trailer and taught herself how to successfully back up the trailer and put it just where she wanted it. Yes, it was a time of grief for her and we were all in a great deal of emotional pain, but she was able to keep functioning. I’ll just conclude this little story by saying, she did get the trailer and it was in our family for another 15+ years after the divorce. 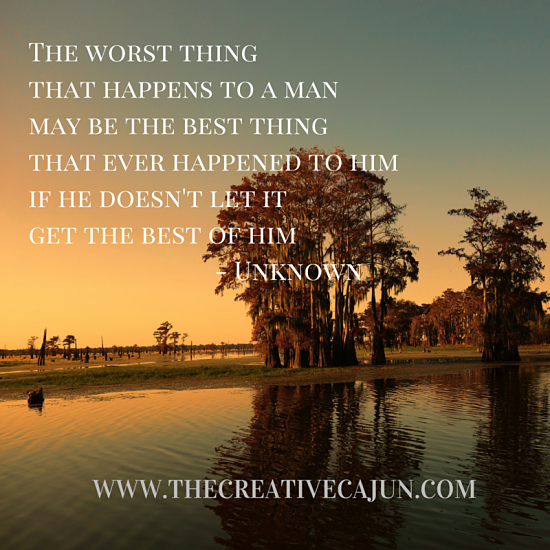 What stories of resilience can you share about the Cajun culture?